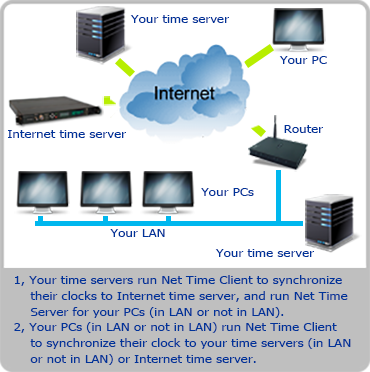 The Net Time Server & Client application allows you to synchronize your PC's system clock or all PCs' system clock in your LAN using various time server types commonly available on TCP/IP networks, including LAN and Internet. Multiple time protocols are supported, including NTP/SNTP, Time, UnixTime, and DayTime protocols. As Client, it can be configured to synchronize your system clock to any time server using NTP/SNTP, Time, or UnixTime protocol. It can work as unicast, broadcast, and manycast modes. As Server, Net Time Server & Client will itself provide time services to other computers using NTP/SNTP, Time, UnixTime, and DayTime protocol. It can work as unicast, broadcast and multicast modes. You can synchronize your Windows, Unix, Linux, FreeBSD, etc system clocks via NTP/SNTP protocol, too. Net Time Server & Client normally runs as a standard 32-bit Windows 95, Windows 98, Windows Me, Windows NT4, Windows 2000, Windows XP, Windows 2003, Windows Vista, Windows 7, and Windows 8 application. In Windows NT4/2000/XP/2003/Vista/7/8 system, it can work as a system service. You can monitor the status of the service and control it. The Net Time Server & Client also supports automatic Dial-Up Networking connection, automatic shutdown and more. Attractive interface and very reasonably priced. It is a simple yet powerful time synchronization solution for your business or for your personal needs in a networking environment or on a single machine. Please read the Net Time Server & Client User Manual. Multiple time protocols are supported, including NTP/SNTP, Time, UnixTime, and DayTime, the latest SNTP (RFC-4330) is supported too. In client, a time servers queue is supported. Flexible synchronization time are specified to synchrinize automatically, including manual and periodical operating modes. Ability to synchronize after the system clock is changed, the dial-up network connection is opened, system starts, etc. It is able to work as a time server so you can synchronize any computer's clock to your PC in your LAN or Internet (only full license or site license). You can synchronize the Windows, Unix, Linux, FreeBSD, etc. system clock to your PC in your LAN or Internet. It can work on unicast and multicast modes. You can monitor the status of server and client, and save to a log file. It can work as a system service, you can start it without being properly logged into your computer (only site license). Ability to automatic open dial-up networking connection. Hides in the system tray and does not require any desktop space. System tray popup menu for easy access to main functions.